If trading in the stock market gives you a rush and a sense of adventure, you can continue doing it even after you have reached the conventional "retirement age"; there is no age limit for a trader. Trading is one profession which you can choose to never retire from. If trading in the stock market gives you a rush and a sense of adventure, you can continue doing it even after you have reached the conventional "retirement age"; there is no age limit for a trader. All you require is a DEMAT account and access to the internet. Most broking firms today provide you with an online trading portal. If you are a smartphone user, things become even more comfortable as you can simply transact on your phone. The trading portals and smartphone applications provide free analyses and forecast of stocks through easy-to-understand charts, diagrams, and tables. With a few basic lessons in trading and a bit of practice, you are good to take on the stock market. Though most people would have saved up for their retirement through regular modes of investments, by continuing to trade, you can earn additional money on your corpus. You can use this money for emergency purposes or to satisfy your materialistic urges. After all, extra money has never hurt anyone. If trading is a hobby, it will rejuvenate you and keep you active through the day. 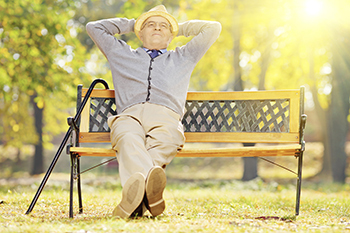 Retirement can be boring for a professional who has worked most of his life dealing with challenges and solving problems. A hobby, especially one that makes money, can be adventurous and can keep you on your toes. Put aside a small part of your retirement kitty for trading and term it as risk capital. You should not cross this limit and restrict your day trading to this amount. Maintain separate accounts for trading and savings. These should not be connected or associated in any way. Do not pool your retirement assets with your risk capital. This way, even if you suffer a big loss, it would not affect your retirement assets. In case you earn a profit, you can always transfer it. 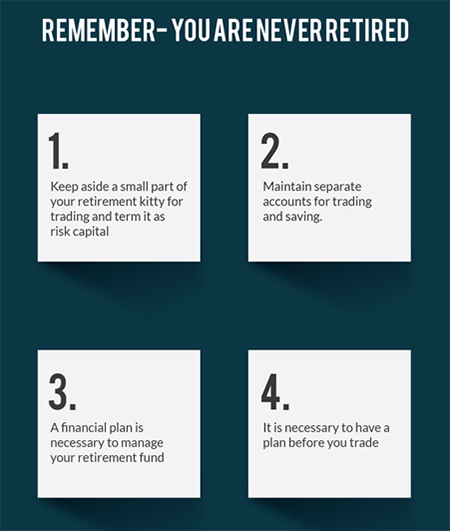 A financial plan is also necessary to manage your retirement funds. The amount used for trading should be budgeted, and you must exercise control not to exceed this budget, no matter how high the temptation. Do not get obsessed with trading. Treat it as a hobby and allocate funds accordingly. A financial plan based on your goals can help you keep a check and not go overboard. Therefore, is necessary to have a plan before you trade. Proper analysis of the markets with inputs from experts is essential. Above all, remember not to let success get to your head. Trading is not gambling. It is just like conducting your own business, where you make informed decisions and calculated risks.